Angel Pagan #16 of the San Francisco Giants celebrates after the Giants 9-0 victory against the St. Louis Cardinals in Game Seven of the National League Championship Series in San Francisco, California. The San Francisco Giants have completed another improbable journey to the World Series. Last night, they blew out the defending champions St. Louis Cardinals 9-0. They did so in game 7, clawing their way back from 3-1 series deficit. That means that they became only the third team in Major League History to climb back that far in a National League Championship Series. The Braves did it in 1996 and the Marlins did it in 2003. 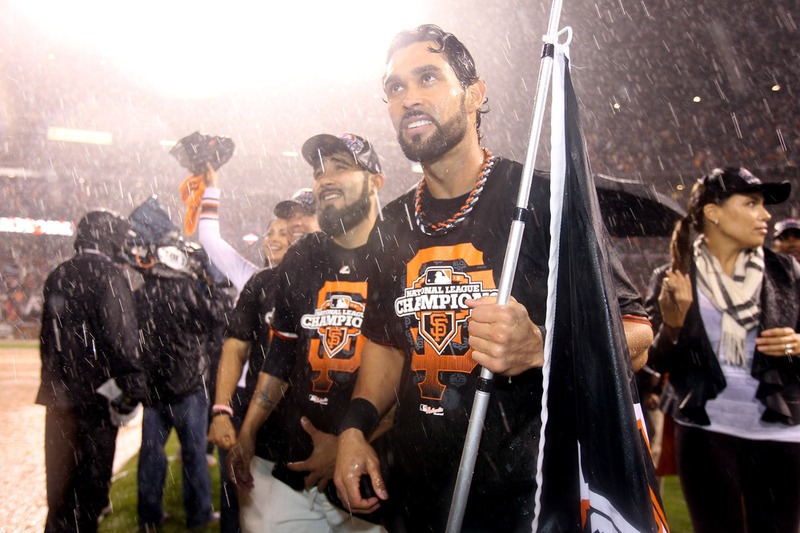 "How fitting that it happened in the rain," team president Larry Baer told The San Francisco Chronicle. "October is our most beautiful month in San Francisco and it's pouring outside. It's crazy, just like everything this team has done." "Hunter Pence got the Giants going with a weird double, Matt Cain pitched his second clincher of October and San Francisco rode Marco Scutaro's steady bat yet again. "San Francisco won its record-tying sixth elimination game of the postseason, completing a lopsided rally from a 3-1 deficit." So if you're a fan of storybook sports narratives, this World Series is one to watch: With the Giants you have a scrappy bunch of misfits who never gave up. And in Detroit, you have an unlikely Triple Crown winner in Miguel Cabrera leading a team that has not won a World Series since 1984. Jim Leyland, the Tigers manager, is looking to become the third manager in history to win a World Series in both leagues. Leyland won a World Series in 1997, as a manager for the Florida Marlins. The first game is in San Francisco on Wednesday at 8:07 p.m. ET. YnO1vb Very informative blog post.Much thanks again. Want more.